Manchester City’s league campaign reached crisis point on Wednesday night. A team that looked so renewed last week wimped out at Anfield with an abject and timid performance reminiscent of…two weeks ago. Yet somehow, it was disaster avoided; City’s title rivals all dropping points in what is shaping up to be a ridiculous end to the season. The only question beckons: surely Manchester City won’t huff and puff out of a title race so early and this open? Saturday’s visitors come in the form of an all-but-buried Aston Villa side. The Premier League mainstays sit bottom of the table with just 16 points and not a glimmer in sight. To get a better picture, I spoke to Football Writer Sam Tighe, who covers Aston Villa for Bleacher Report. Sam, what’s gone wrong? Has this horror-show been in the making for years? It’s been in the making for many years. The starting point was Martin O’Neill’s shock resignation, and everything has gone steadily downhill from there. The fans want Randy Lerner out (he is trying to sell, to be fair) and most of the board ripped; the common complaint is that none of the front office really know what the hell they’re doing, and there’s probably some truth to that. Christian Benteke’s brilliance papered over the cracks for three seasons, but with the squad gutted during the summer, the team have finally sunk. How much blame can placed at the foot of ex-City boys Joleon Lescott and Micah Richards; two regulars at the back who just haven’t cut it this season. Micah Richards has said all the right things in the media and should be commended for his bravery in confronting angry fans and possessing the willingness to speak. But his bold words on paper have not been followed up on the pitch, and his erratic performances have been a big problem. Joleon Lescott started very poorly but then picked up after a month. He scored (or forced) two critical goals and had begun to win the fans over, but “that” car tweet has wrecked everything. What’s next for Villa now? Does the squad have to be ripped up and rebuilt or do you have little hope for anything while Randy Lerner is still in charge? 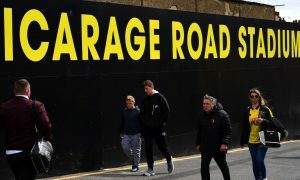 It’s all in flux, and the prevailing worry is not only that Villa do not return to the Premier League at the first time of asking next season, but that they could do a Wolves and be relegated again. The whole thing is a mess, and you’d imagine 70 percent of the current playing staff will leave at the end of the season. One City player you’d take at Villa right now? Any of them, all of them, even some of the kids. If you’re making me pick, though, it is of course Sergio Aguero. The thing Villa badly need but cannot procure is goals, and Aguero is king in this regard. Is it going to be another killing for the Villa this Saturday? Yes. My official prediction is 4-0. Thanks for coming on Sam. I sincerely hope to see your lot back in the Premier League again soon.